Ready for your home projects! Speed through the Lexmark X5650 easy install and then print fast, copy with 1-touch of a button, send a fax or direct print lab-quality photos with USB flash drive or Memory Cards. Even connect your laptop easily with the quick-connect front laptop port. 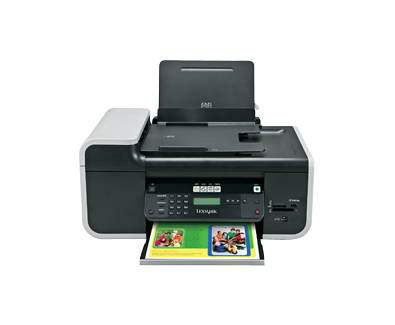 (3) Compared to one standard black cartridge and one standard colour cartridge for this printer. (2) Printing in draft mode and excludes time to first page print. Visit www.lexmark.com for details. (1) Non-refillable cartridge licensed for single use only. Return empty cartridge only to Lexmark for remanufacturing, refilling or recycling. A variable amount of ink remains when this cartridge must be replaced. Replacement cartridges (36A, 37A, 36XLA, 37XLA) sold without those terms are available through www.lexmark.com.